Everyone seems to have an area in their landscaping they hate to look at. We’ve had one for about a year now where we had a tree cut down. All that was left was an unsightly ugly molding tree stump. 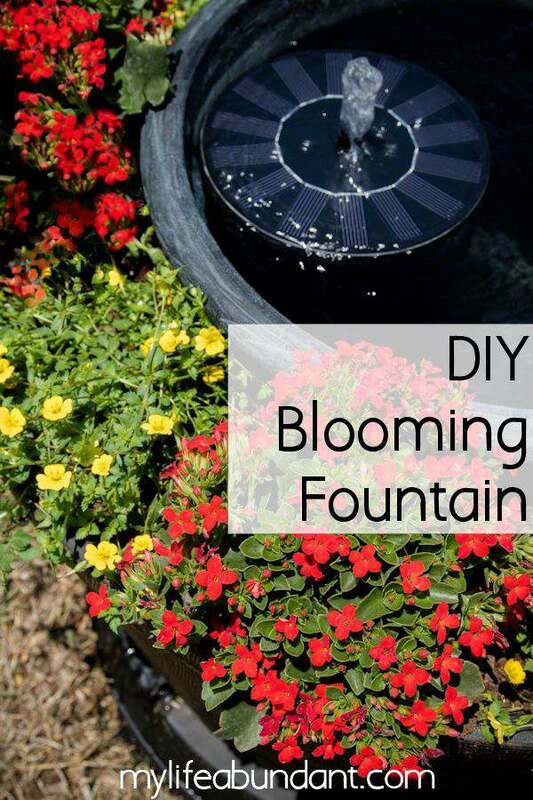 It was time to brighten up that area up with a DIY Blooming Fountain. As you can see, this stump was really not very attractive to look at every day. We started the project by cleaning around the stump and adding small blocks to level it out. We placed an old water heater pan upside down on top of the stump to hide the pieces of wood. Hubby then painted around the edge of the pan black so it would blend in with the pot. He then placed a large plastic whiskey barrel planter on top of the pan. 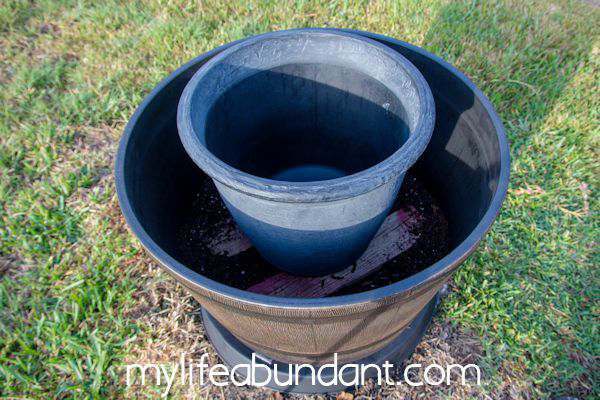 Make sure there are plenty of holes in the bottom of the large pot for drainage. 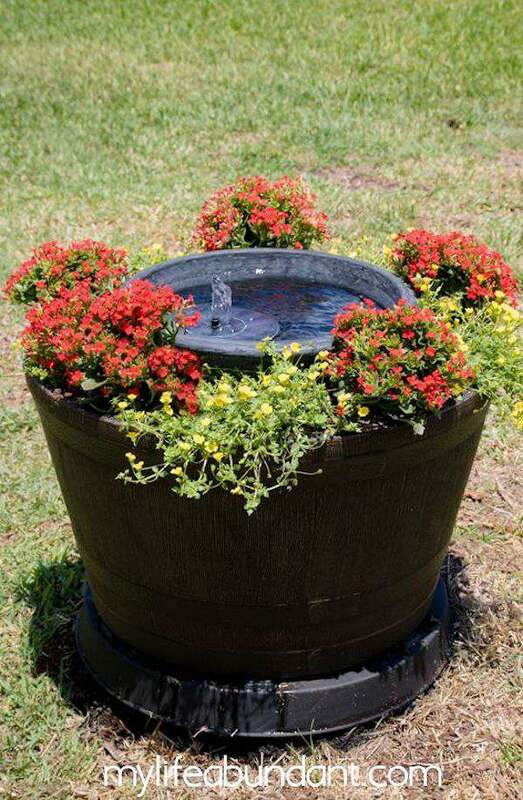 This planter will hold the potting soil and the flowers. We needed to have something in the bottom of the pot to hold up the smaller pot, so he added two small blocks of wood. You could also use a layer of rocks on the bottom. Next, he sat the smaller pot on top of the wooden blocks which will hold the water for the fountain and made sure it was level. When choosing the smaller pot, we made sure there weren’t any holes in the bottom. Then we added potting soil all around the sides of the large pot. Now for some fun. It was time to add some color! While looking for plants at our local Lowes, we wanted sun-loving plants which would hold up in the Florida sun and heat during the summer. 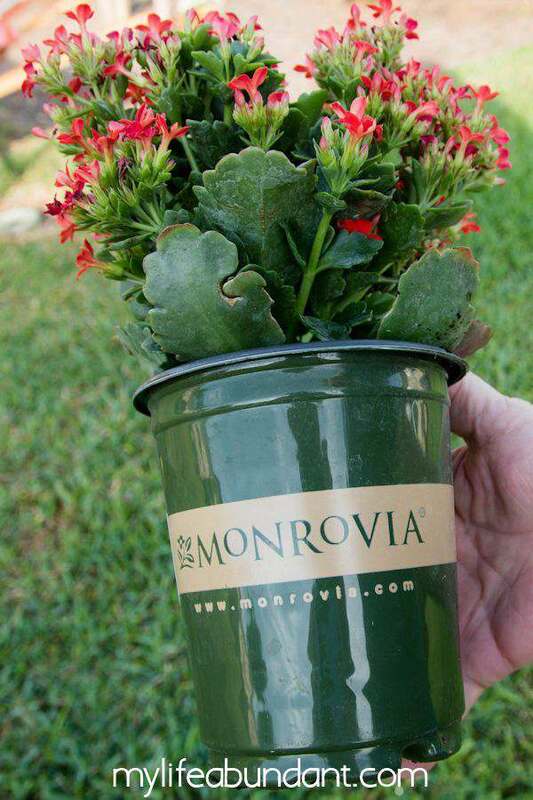 I can always count on Monrovia plants when looking for long lasting and healthy plants. We chose Kalanchoe which is a beautiful tropical succulent with vibrant scarlet red flowers. Hubby’s favorite. We also chose Mecardonia with the bright little yellow flowers and is so perfect next to the red. 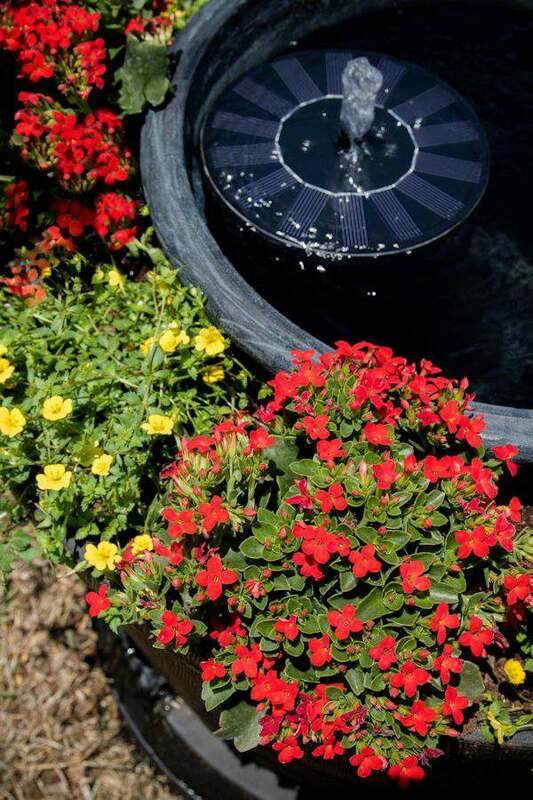 Both plants are durable, love the heat and bloom spring through fall. I was able to go to the Monrovia website to find out all the information about so many plants. I planted the flowers all around the edge of the pot and filled with potting soil where needed. Next, I added water to the smaller pot and laid the solar fountain in the water and immediately it started up. We chose a solar fountain because we didn’t have electricity in that area and it stays in the sun almost all day long. Be still my heart. Isn’t it just lovely!! The sound of the water is so refreshing. The ugly spot in the yard is now a beautiful blooming fountain we can enjoy most of the year. The neighbors also love our new blooming fountain because it sits in the backyard where they can enjoy from their lanais. I can also see this being on a deck to enjoy when you are entertaining. To attract birds, just change out the head of the fountain to make a spray action. To find plants for your yard, be sure to stop by your local Lowe’s and pick up some Monrovia plants and give your yards “eyesore” a new makeover. Sign up for their newsletter with updates of the latest plants available in your area. This is adorable, Tammy! What a perfect cover for your tree stump. I would love to make something like this. Swapping out the fountain head to attract birds is an awesome idea. Pinned :). I’ll have to try this! Thank you Candace. We love how it turned out and so much nicer to look at then the ugly stump. We have an old stump out back in the middle of our yard and this would be the perfect project. Going to show this to my husband and see what he thinks. Plus it doesn’t look all that difficult to put together. What a great idea! I have three old stumps in the side of my house and I think this is the perfect answer to covering them up. 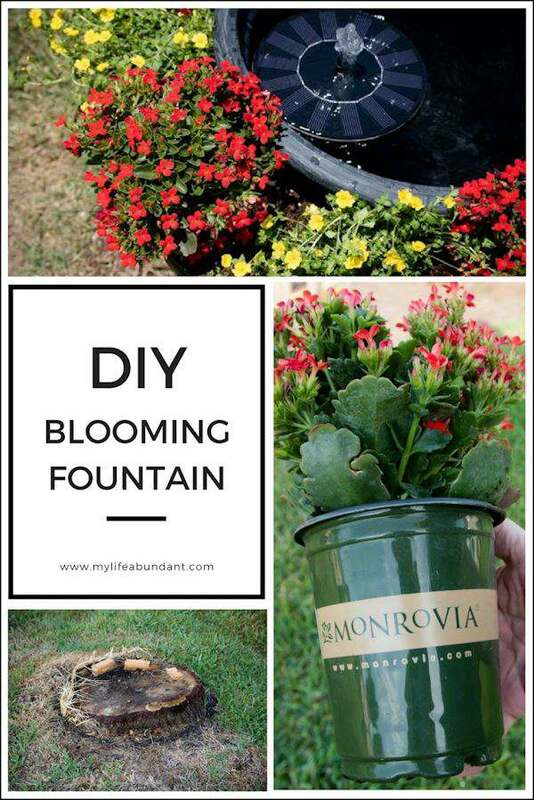 Your blooming fountain is beautiful! I do believe I could do this by following your step-by-step tutorial. Monrovia plants are always so healthy and pretty. I need to get to work in my flower gardens and add some more colorful flowers. Oh my goodness, I love this I totally want to make one for my garden now thank you so much! It’s good to know that I could use this DIY to make something like this for my home. That really adds a nice touch to a garden. I’m just so bad at watering plants that I’ll probably kill them. I love how this looks. I need to add one of these to my yard. I love your idea and how you made a fountain. I find it amazing at such great ideas and when completed it is such a change !! I love this idea. This is so beautiful and creative. I love that! It looks like it is so peaceful and colorful too. I wish I had a place for this. Our yard is so tiny that we never use it. That is such a pretty fountain! I would love to make one, I just don’t know where I could put it in my yard. This is so pretty! I wish I could grow stuff but alas, I have a black thumb. I’ll show this to my mom though. She can grow stuff! 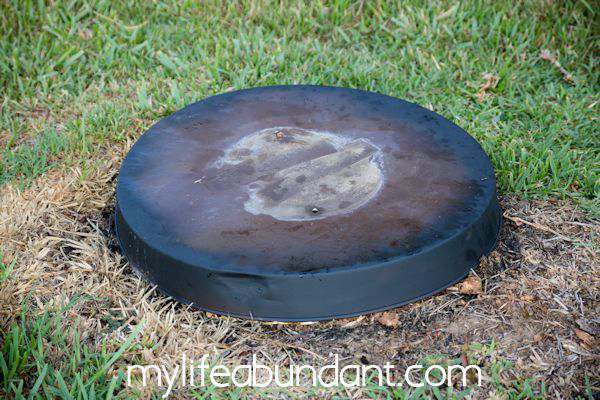 This is an awesome idea, but were do you get the solar fountain who sells those. This is going to look great in my back yard. I have been planning on making an oasis for myself to relax in. What a cute idea for an area in the backyard that you just don’t know what to do with. I bet I could make this. This is a great idea and I have a great place for it. I haven’t seen a solar fountain in my area, I will have to look again this year. This project turned out beautifully! I haven’t had time to get any work done in my garden this spring. Wow, this is a great idea! Never thought of this before. Been thinking of doing something like this but I don’t know how to start. Thanks for sharing your innovative idea! 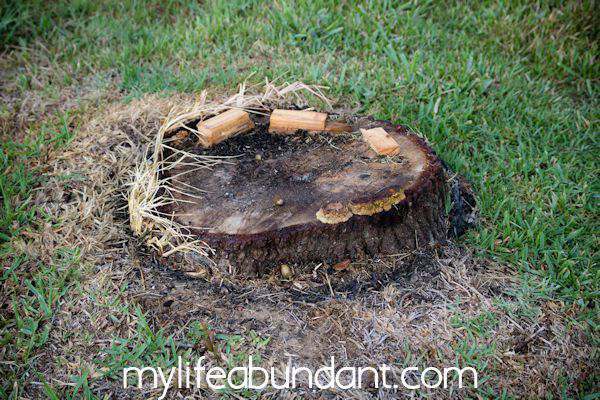 What a great idea for old stumps. I’d like to do something like this. Thanks for this tutorial. What a great DIY. It’s been cold and rainy here this past week but as soon as the sun starts to warm things up I think I might have to give this a go for our backyard. I think my youngest would love it! 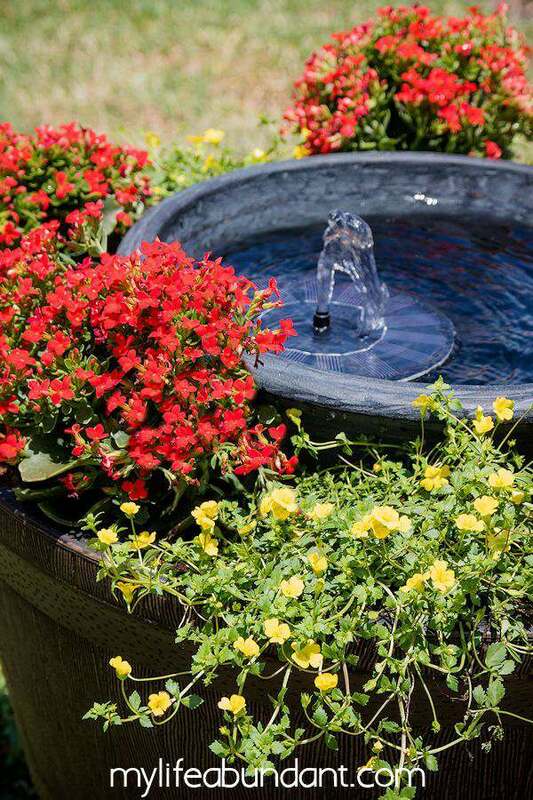 This is a really smart way to combine flowers with a water feature. It’s small & simple, and something anyone can do with a small budget & time. This is such a lovely addition to a garden! I would love to have something similar one day if I ever have a garden of my own. Well that was a very clever way to conceal an unsightly stump and to add something more aesthetic to the yard. We had an old stump too from the last hurricane but I just rented a stump grinder and shaved it down then filled the area with fresh soil and seeded it. You can’t even tell a tree once stood there. What a neat idea! I love that it not only covers up a stump in the yard but it add so much color! This is just spectacular! I would love to have something like this in my back yard. it would be so relaxing! This is just wonderful! When I want something on the yard, I called the landscaper. But now, I’d do it myself! Wow! 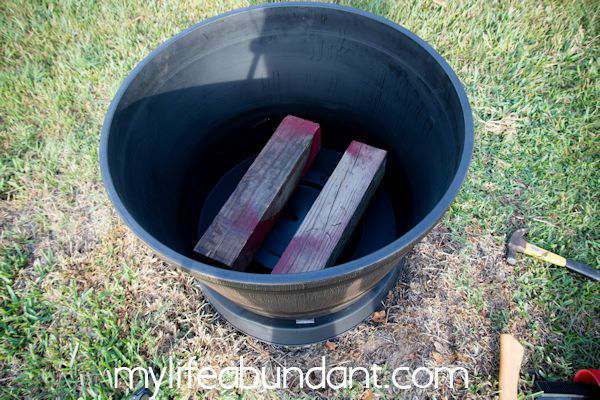 Tammy–I love your creative fountain idea. The addition of the flowering plants was genius! I love it! Cool idea! That would look lovely in my garden too. I will have to ask help from my husband. I just love the pretty flowers! I love this so much! Such a great idea to update your yard. Love Monrovia flowers! Wow. That was really nice! It was a really pretty way to work around an unsightly tree stump! The Monrovia flowers are so pretty too. AH! I love this! My parents have a few stumps in their yard and I bet they’d love this. Just in time for a Mother’s Day project! This is so beautiful! I would have never thought to do something like this in my front yard.